SIR BOB GELDOF took aim at world leaders and Aung San Suu-Kyi in a wide-ranging speech yesterday, calling the latter a “disgrace” that “insults” those who’ve fought for justice and peace. 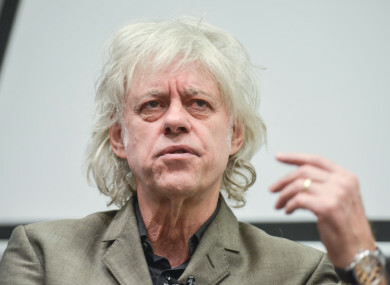 Speaking at the One Young World conference in Colombia, with former UN Secretary-General Kofi Annan and Nobel Peace Prize winner Muhammad Yunus in attendance, Geldof said that he was “fed up with this world” and “sick of what has happened” in the past 12 months. The Boomtown Rats singer referenced the attendees and said that “one of their number in Myanmar insults them” and mentioned Suu Kyi’s own Nobel Peace Prize. He said: “Insults them all. Took the greatest prize that humans can give one another. And then becomes one of the great ethnic cleansers of our planet. It’s a disgrace. I am sick of these leaders. I am sick of Putin. I’m sick of Xi Jinping. I’m sick of Trump. I’m sick of Erdogan. I loathe these people. I despise them. How dare they behave in the manner they behave. Suu Kyi, and her government, have come in for heavy criticism for a military crackdown on Rohingya muslims, an ethnic minority in Myanmar. More than half a million Rohingya muslims have fled from Rakhine in western Myanmar to neighbouring Bangladesh in the last month after a militant attack sparked a vicious military campaign. A petition with nearly half a million signatures have urged for her Nobel Peace Prize to be withdrawn. Councillors in Dublin have told TheJournal.ie that they would support the award of the freedom of the city to be taken off Suu Kyi. Honoured in 1991 for her pro-democracy resistance to Myanmar’s junta, Suu Kyi was long hailed as a champion of equality. But now, as Myanmar’s figurehead leader, she has been broadly criticised for failing to protect the Muslim Rohingya minority from what some world leaders are calling “ethnic cleansing”. Geldof also took aim at the current problems facing the world and said that the “old traditions have failed us”. He closed by urging the young people in attendance to come up with the ideas that would change the world for the better. Email “Bob Geldof says Aung San Suu Kyi has become 'one of the great ethnic cleansers'”. Feedback on “Bob Geldof says Aung San Suu Kyi has become 'one of the great ethnic cleansers'”.